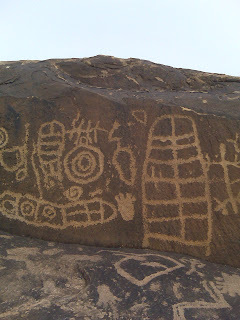 I have been desirious to look at the petroglyphs located above the Santa Clara river for several months, but either due to weather, or lack of time I have not been able to go. Saturday I decided I would find them. 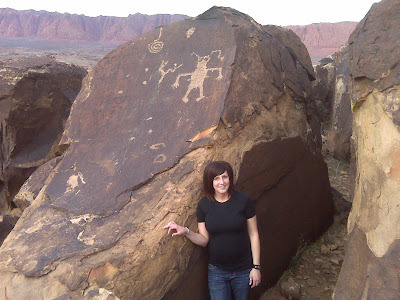 As my wife and I drove towards St. George to run errands, I asked if she cared if we went on a little adventure. Luckily for me I am married to someone who understands me! She told me I had an hour, I would like to remind any reader she is over 6 months pregnant and hiking is not high on her list of things to do right now. 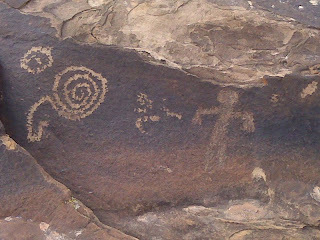 As we hiked along there were several indicaters of rock art left by the Anasazi who lived in the area, and we found several panels on the top of the rocks. 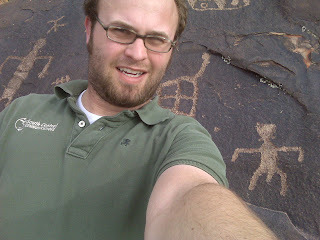 These petroglyphs are a little strange compared to the others I have seen. 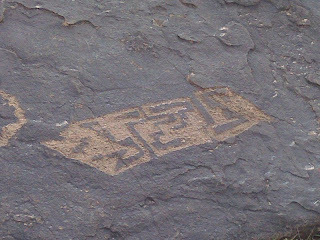 Traditionally they are carved on a verticle rock, most of these ones were carved on the top of horizontal rocks. After an hour my time was up and we decided it was time to turn around. As we began hiking back the same route, I heard voices coming below us. The voices were stationary so I assumed they must be looking at something. We hiked toward the voices and found the best panels of the entire hike. 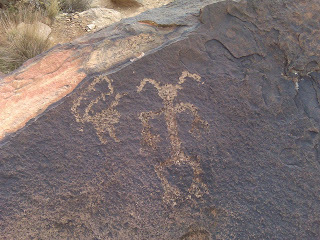 One shaman figure on one rock, and on another rock two very large goats with what appears to possibly be a mountain lion following them. Finally after my hour was well up, I thanked my beautiful wife for coming with me. 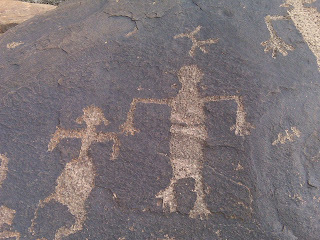 I told her that finding these sites is like a pirate finding his treasure. There is quite a bit of photographic potential here. On a clear day with the sun shining on the red cliffs behind it could be quite amazing. 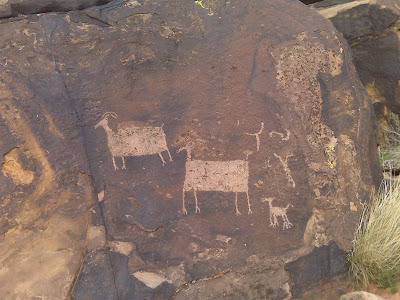 The mountain goats are actually quite large the bodies are at least 1 ft x 2 ft. 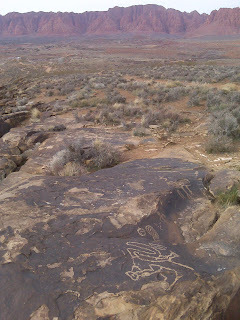 I dont know for sure but it looks like a mountain lion following them at the bottom right. I wish we knew what this meant! A calendar? A map of some sort?